She grew up in my house and she went out whenever she wanted, but she didn't go far away... She stayed at my window all day long! 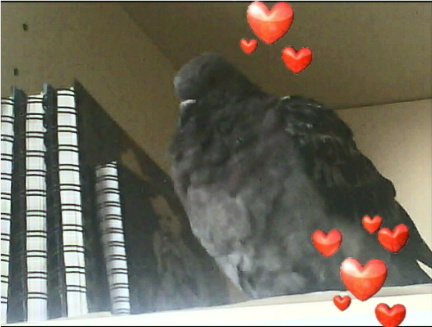 Dakri fell in love with another pigeon and she brought her companion to my house too, whom I called Eros ('Love'). Then they made another friend, a skinny pigeon that made very sudden movements and looked funny and I called him Lignos ('Skinny'). Three years have passed since then and these three (Dakri, Eros and Lignos) still come to my window everyday! 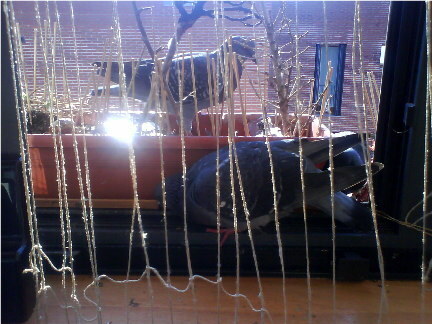 I have now covered my window with plants so that the neighbours can't see them, but the problem is that in a few days I will move house and I don't know what will happen to these three lovely pigeons when I'm gone... I have been feeding them every day for three years, but now they will remain without food... Could they survive without my care?? I'm thinking to capture them and take them with me to the new house, but will they become used to living in a cage (since they are used to being free all these years)? And how can I know if they are healthy or not? 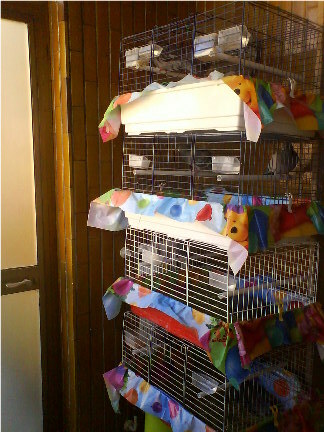 If they are not healthy and I put them with my birds they may pass their diseases to my birds too... What should I do? What is best for them? I'm afraid that if I leave them here, if the people who rent my house hate pigeons like my neighbours, they may poison them or put spines at the window and harm them... How can I save them and at the same time protect my pet-pigeons from new diseases...? Should I give Dakri, Eros and Lignos any medicines in case they have hidden illnesses? Any suggestions? Irene...if you think they don't have babies some where, personally...I would take them with me if I were in your situation. iI may be that after time you will be abler to let them go from your new place, as you have done where you are now. I so enjoyed reading your story, Irene. I am equally as sad that Doraki and her friends never returned after the neighbors complained. You are a true pigeon angel, doing what you can for the ferals. As far as the situation with Dakri, Eros and Lignos, if it were me, I would try to take them with you. They will eventually move on if left behind but I don't know how soon. Do you know if there is a flock nearby where you are moving that you could maybe release them to? I'm so happy that we all have the same mind...! Thank you for your kind and encouraging words! Ok, I'll capture Dakri, Eros and Lignos and put them in a cage so as to take them with me to the new house! The good thing is that my new house is on the last floor and it is the only flat on that floor so I won't have any neighbours to complain...! It has a long and wide balcony which is really enormous!! I'll fill it with plants and flowers and transform it in a garden. When Dakri, Eros and Lignos become used to their new environment, after one or two months I may open the door of their cage and let them get out so they could fly around on the balcony... Another good thing is that the new house is out of the city and there are no strict laws against pigeons as here in Venice... Here it is fobidden to feed pigeons in the WHOLE city, so I was always afraid of the neighbours and their threats... but hopefully in my new house the situation will be different! I'm really glad I found this house, it seems perfect for my pigeons...! So, I'll go to buy an extra cage and I will try to capture the birds...! Do you think I should give them any medicines in case they have diseases or something for the parasites? You new place sounds lovely, Irene. I'm glad you suggested keeping them contained until they get familiar with their new surroundings. Otherwise they would most likely fly back to your former place. Irene...it would be good to spray them for mites and treat them for canker. The story of your friendly ferals is very moving, and it's very kind of you to try to do the best you can for them. I totally agree with you, Cindy and Charis, as I would also take them with me, especially knowing how unfriendly the neighbours are. Treating them for mites and canker, as Charis recommended, is a very good precaution. You will also have a chance to observe them cosely when you've got them in their cage, and see if something is not right. Your new home sounds perfect for you and for your friends, and I'm sure you'll be very happy there. Irene, your story is really very moving. I would feel just the same. I am very glad that you have found a new home for yourself and your feathered babies. It is just very nervewracking that thing with stupid neighbours. I know it myself! I'm glad you caught him, Irene. Really...it would be better to spray him for mites right away. You don't want them leaving him and getting on your birds and hiding in you things. Ok Charis, I'll spray him in the morning. Now it's night and he looks sleepy, although he is still awake... maybe because he sees the light of my computer... I'm going to bed so perhaps if it is complete darkness he will manage to sleep... Goodnight or goodmorning (if it is morning there..)! It's good that you're keeping him separate from your other pigeons, and best not to put Comis and Selini with the newcomers, even for a short time. Even when you buy new pigeons from a reputable dealer and they're healthy and vaccinated, it's best to keep them in quarentine for a while -- just in case! I'm just worried that if you put Lignos with Eros and the female, Eros will attack Lignos. Would it be possible to let Lignos have a cage/carrier of his own? Hello, I have some news to share with you! The pigeon that I caught a few days ago is not actually Lignos, it just looks like him! Lignos came to my window the day after, together with Eros and Dakri...! I put some seeds for them to eat but Lignos attacked the other birds and he chased them away! So I caught only him! He made a great fuss!! I put him in the big cage together with the other pigeon and he was flying around in panic like mad! He is a very lively and noisy pigeon! The first pigeon is probably a female (because it is very small) and I called her Mira ('Fate') because it was her fate to fall in my house... Mira is very calm now and she doesn't try to escape from the cage anymore... She has started eating and drinking and she likes sleeping in the boxes-nests that I have fixed in the highest part of the cage. Lignos has also started to enjoy the domestic life! He is eating, drinking and cooing to attract females...! The day after I caught Lignos, Dakri and Eros came to my window again! This time it was their turn to be caught and fortunately I caught both of them at once!! I'm sure my cat is jealous of my ability to catch birds so easily! Eros liked the cage immediately and he conquered one of the nests, but Dakri was desperate and wanted to get out! Lignos was annoyed by her violent movements and he attacked her, so she went in the box-nest of Eros and she calmed down too! 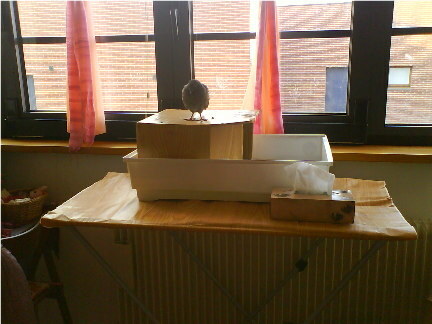 The next day, I had left the window open and three more pigeons came into my house... so I caught them too! One seems to have a broken wing which is hanging and the other one has cut feet and most of its toes are missing... poor birds... They both look miserable... The third one is a very aggressive quarrelsome male that comes often at my window to make war... I have called him Drakos ('Dracon'). But I still haven't found names for the other two... Any suggestions? 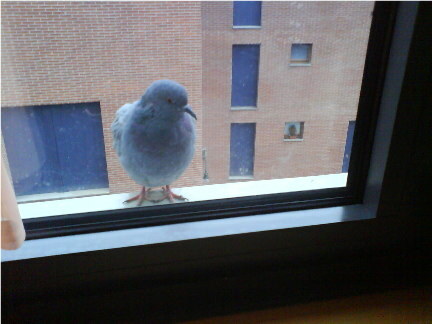 Then another pigeon appeared at my window and it came inside my house without hesitating at all!! I started walking towards it slowly and silently and I grabbed it! It did not react though... It was very calm and I was surprised! All the other pigeons tried desperately to escape from my hands, but this one was not moving at all!! It did not seem to be scared of me... It was strange! I put it in the cage and it was still not scared... It did not even try to get out! It went to eat the seeds from the bowl as if it was the most natural thing in the world! As I was watching it with curiosity it suddenly seemed familiar to me...!! Its extremely short splayed legs, its big hairy belly, its large fish-like tail, the big contrast between its dark wings and its fair body, its sweet expression... all seemed familiar to me... I suddenly realised that I had in front of me Doraki!!!!!!! 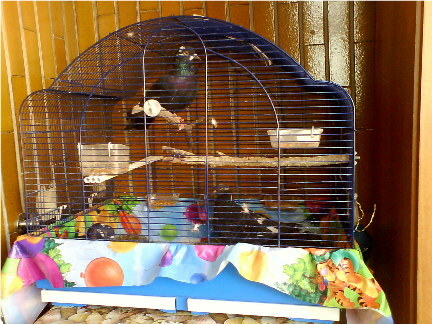 My pigeon that was lost for two years, which I thought that my neighbours had poisoned!!!!! It is actually alive!!!!!! It has come back to me after all these years!!!! I was so moved that I almost fainted!! Finding Doraki again is nothing less than a miracle!!! Now I think that Doraki had disappeared because the other pigeons chased her away from my window and they didn't let her come close, but she always stayed near me, although I couldn't see her... When I caught all the other pigeons that used to stay at my window and the window was finally free, Doraki found her chance to come back home!! I'm so happy to have her back!!! I sprayed all the 8 feral pigeons for external parasites as Charis suggested! They didn't like it at all, but fortunately it is over now! I'm thrilled that Doraki showed up safe and healthy after all this time, Irene. My goodness!! You do have a house full now. Do you have any idea when you will be moving? Wow, that was exciting reading!!! I'm so happy that Doraki is alive and back with you! Aren't you going to have problems moving the big cage? I thought you were going to take it apart for moving, as it must be really difficult to move it with all the pigeons inside... or are you going to take the cage and move the pigeons in carriers? I'm really glad that you share my joy for finding Doraki again! It is wonderful indeed, it seems like a dream! Teresa, you made me laugh a lot when you said that if I continue catching pigeons I will empty Venice! Well, now I have 10 (I caught the other two that were coming to my window, too!) 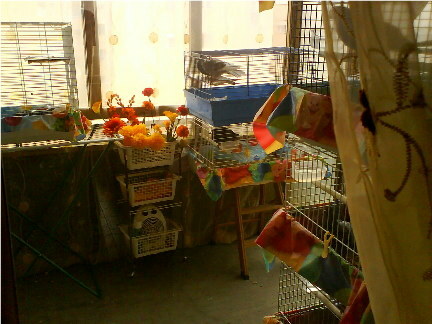 but the cage is overcrowded and unfortunately I can't catch any more (although there are still some pigeons coming to me...) A couple of days ago, I saw a lady who was feeding them secretly in a corner and I was very happy! She emptied a whole bag of seeds for them to eat and she went away quickly and disappeared like a thief...! So it seems that I'm not the only one who cares for them and this gives me hope! Now I know that when I go away, the pigeons of my neighbourghood are not going to starve to death! My ten feral pigeons have started to enjoy the domestic life! They don't try to escape anymore, they are eating, drinking, cooing and mating as they did when they were free! The only problem is that they are fighting a lot! I bought a new cage and I put two of them in it (Eros and Dakri) so as to have their own space. I want to buy more cages, but unfortunately I couldn't find any more in the shops... (they had only small ones for canarines...) I really need some extra cages because, as Teresa said, I'm going to take the big cage apart so as to trasfer it to my new house... It's so big that it cannot even pass through the door! This cage is my No 1 nightmare right now... Another problem is that it may take me many days to put it together again, because when I built it, I had spent more than 2 months working on it...! So when I destroy the big cage, I'll have to put the feral pigeons in smaller ones. But I'll carry the pigeons to the new house in carton boxes with holes because even the small cages are too big to carry in hands... Unfortunately here in Venice there are no cars nor taxis, so I'll have to carry everything in my hands and then take the ferryboat to get out of the city. Once I'm out I can take a bus! It's all very complicated...! But I'm really glad that I have found this new house which is much bigger than my last one and so me and my animals will have more space and comfort! 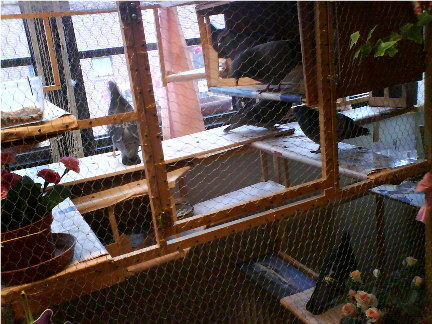 I'm sending you some photos of my feral pigeons in the huge cage to see how big it is...! Love the cage. You did a wonderful job. I wish I were closer so I could help you dismantle it and get it set back up. I especially love the pink bow. It's wonderful that there is someone else caring for the birds. I know this makes you feel much better, knowing they will be looked after. That's a huge job you're taking on, Irene! God bless your kind heart for helping all these birds! The big cage looks great! You built it yourself...? My gosh Irene sounds like you will be moving just the pigeons for a few days! I hope you have someone else to help carry them. Since you have to take apart the big pigeon cage when you move it to the new house & rebuild it you will know what the pijjies like about it & what didn't work with it. I've had to take down large flights & when I rebuilt them they turned out even better! Sounds like with 10 pigeons you are going to have to enlarge the cage! Good luck with your move I hope all goes smoothly for you. My dear friends, here I am again to tell you the news! I have finally finished moving my things to the new house and I'm very glad! 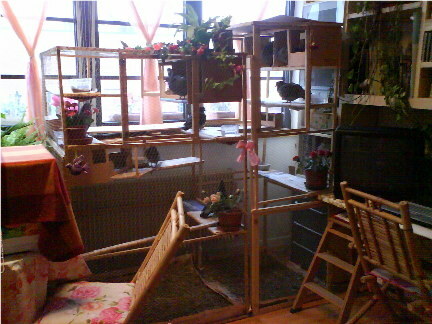 I had to demolish the large cage that I had built myself (thank you for your kind comments about it!) but I put its pieces in the storeroom of my new house, so I hope to be able to rebuild it and even to improve it, as Robin suggested! 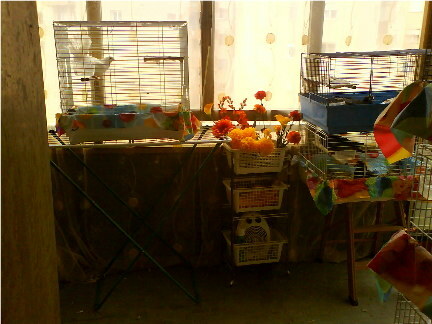 It was very difficult to transfer all these birds and their cages, as you imagined, but some friends of mine came to help me and I'm very grateful to them! (Cindy, thank you a lot for saying that you would have also helped me if you were here!) We put the birds in small carton boxes so we carried them easily... We had to travel on the ferryboat and then we used the car of my friends. It was really great that I didn't have to use the public buses (which would have been a real nightmare as they are always very crowded and sometimes the bus drivers don't allow people carrying big things to get on...! The pieces of the large cage were so big that they did not fit in the car and they bulged out! But we tied them to the car very well, so we managed to transfer them too! in the end we were all exhausted but the job was done! 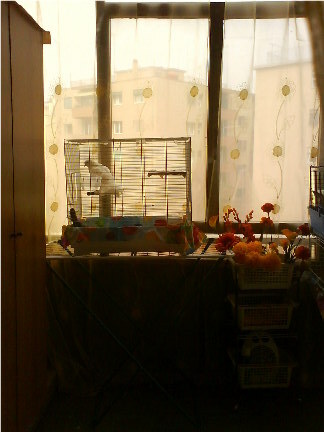 Now my birds have their own room, a part of the balcony that is fenced with glass windows and is protected from the rain and the wind. 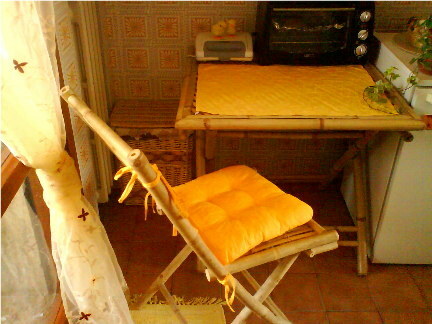 It even has a radiator so the birds are protected from the cold too! 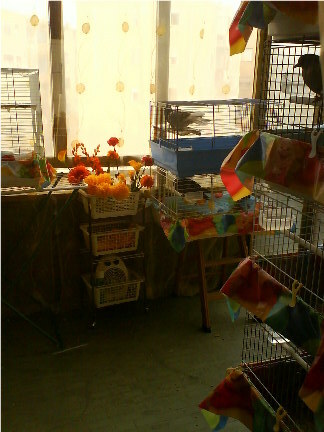 The balcony is really huge (it surrounds the whole flat) so when it is sunny I can carry the cages of the birds out and let them enjoy the sunlight and the fresh air. I have started buying flowers, plants and bushes and I'm going to transform the balcony into a garden, so the birds will like it even more! Perhaps new ones will come as well and they will be very welcome! In summer I will let my feral pigeons free, but I hope that they will come to my balcony often as they did in my previous house and I'll feed them everyday! 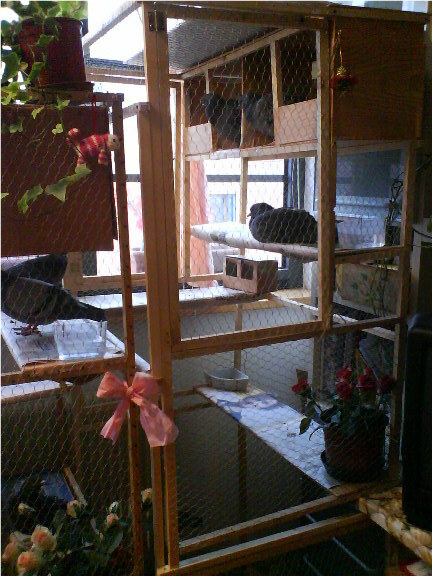 Well, as for now, I'm sending you some photos of my pigeons in my new house so you can see their new room! With so many birds it looks like a pet shop!! The cages look small in the photos but they are actually very big! Hmm... the tower of Babel...!! I love your 'pet shop'! It's great to hear from you, Irene. I'm glad you are finally settled into your new home. Your balcony sounds heavenly. I know the 'garden' setting is going to be beautiful with all the flowers, etc. We would love to see some pictures as everything gets put in place. You really do have a lot of birds. And thanks to your kind heart the ferals were not left behind to be in harm's way. The more exposure to the balcony that your releasable pigeons have, the better chance they will become familiar with it and reture once released. We so appreciate your update and photos. Please do keep us posted on how things are going.